We can rein in our feelings. We can completely alter any situation by taking charge of our feelings. This exact message got good results when a lady the televangelist knew repaired a dysfunctional relationship. The woman and her son constantly fought. Surprisingly enough, after she began repeating the phrase quite often, her son told her he loved her. John 5:1-15 tells the story of a man who let his circumstances overcome him. For 38 years, he had lain by the pool of Bethesda. He couldn’t move. He didn’t try to help himself in any way. He waited all those years for someone to help him into the pool. One day a year, an angel would come down to stir up the water in order to give it special healing properties. Whoever got into the pool quickly would be restored to health. Jesus approached the man, asking if he wanted to be healed. Please note that he asked the sick man if he wanted to be healed, not why he hadn’t received his healing. In other words, Jesus wasn’t asking for excuses. Nevertheless, the man gave him an excuse: he didn’t have anybody to help him into the pool at the right time. What was the Savior’s response? Did he come to the man’s pity party? No! He did something more useful: he made the man whole. Immediately, he said “Get up!” He also told the man to take his bed with him. End of story. Done. A group of men were digging a large pit. It was deep. They noticed a donkey had stumbled into it. They had a hard time deciding what to do. The workers knew they would have to fill in the pit soon. Yet, they didn’t have any way to pull the donkey out of it. They finally determined to just leave him in there. The animal was old, anyways. The men didn’t see a problem with just burying it. Accordingly, they started filling in the pit with dirt. At first, the donkey complained. He cried and whined. It was pitiful. However, he soon calmed down. He quickly learned that he get closer to the top of the pit by stepping on top of each pile of dirt that was shoveled in. Rather than allow the dirt to bury him, he used it to step his way into freedom—little by little. The men were astonished to see the animal finally walk contentedly out of the pit. 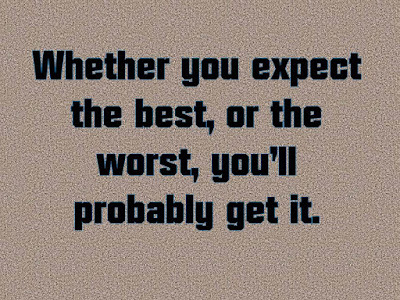 Are you expecting good things to happen?